What causes your Samsung phone stuck in start screen? * When you have tampered with the setting of your phone and you are not sure of how to restore it. * When your Samsung phone has a virus that messes up with the phones touch response. * If the phone falls in water, the screen may not be in a position to respond. 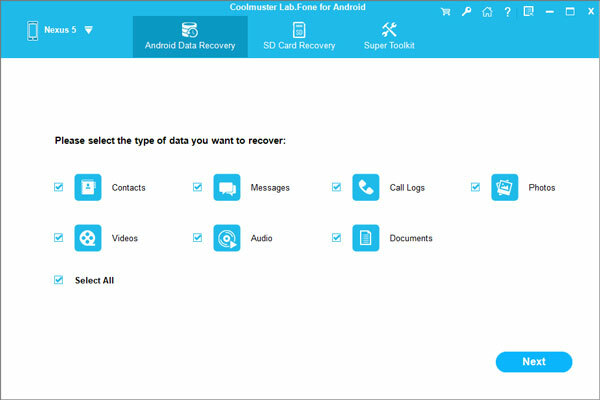 Well, how to recover data from a Samsung phone that have stuck in start screen? The very first step is to do a factory reset for your Samsung device if you are sure the cause has to do with the settings. 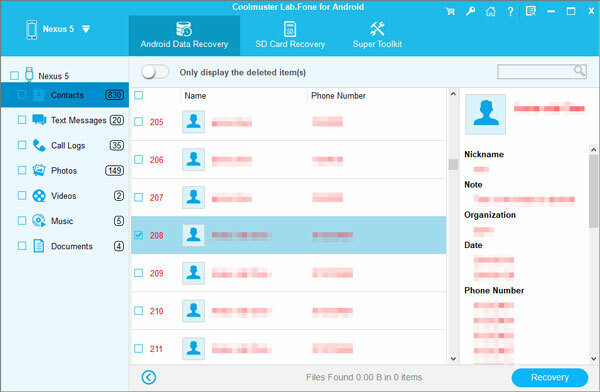 Then, you can draw support from the Coolmuster Lab.Fone for Android, which enables you to recover overall types of data, such as call history, contacts, text messages, photos, videos, music, documents and more from Samsung Galaxy S8, S7, S7 Edge, S6, S5, S4, S3, Note 7, Note 4, Note 3, Galaxy A9/A7/A5, etc..
Now, follow the tutorial in the below to learn how to use this Samsung data recovery software - Lab.Fone for Android to rescue data from Samsung phones stuck in start screen. Launch the Lab.Fone for Android on your computer. Connect your factory reset Samsung stuck in start screen phone to the computer using a USB cable. The software automatically recognizes the Samsung device. Choose the data categories you want to recover, such as "Contacts", "SMS", "Photos", "Call Logs", "Videos" and so on. Then, click "Next" button and the program starts to scan your phone to find all you wanted data in the device. Preview and select the files that you want to recover. After the selection, you can tap on the "Recover" button to begin the recovery task. You can specify a location on your computer to save the recovered data.